Riding a horse at a canter. The counter-canter is a balanced canter on one lead while the horse is traveling in a curve in the opposite direction. No change in rhythm or stride should occur and the horse should be bent toward the lead, not the curve. The counter canter is used to develop strength and balance in the rear of the horse. While engaged in the counter canter, the horse is cantering on a circle going left and the rider deliberately makes the horse canter with the right canter lead, so the canter lead doesn't change when the direction changes. In other words, the horse is asked to canter on the opposite canter lead to that of the direction in which he is moving. The counter canter also increases the workload of the back end of the horse and in the hocks and loins, leading to more muscle tone. It improves cadence and flexibility and leads to greater collection and balance in the horse's moving body. Exercising a horse using the canter creates active lumbo-sacral flexion and so is useful in building strength in the abdominal and sub lumbar muscles that support the horse's back. In counter canter, the abdominal and sub lumbar muscles maintain the position and flexion of the hip, while the abdominal muscles shorten the trunk, thereby requiring more strength and coordination from the abdominal girdle of muscles and this helps to build strength in the horse's hind quarters. From a training perspective, he most important element of practicing the counter canter is that it strengthens the horse and helps the horse move smoothly through the lead changes: No changes occur in rhythm, flexion, bend, roundness, or connection. Everything stays the same. Your work as a rider when using the counter canter to build your horse's strength is to be aware of the drive coming up into the seat of your pants as your horse lifts you up and down in a rotary-type motion with his movements. If the motion feels flat, you've lost the drive and the horse is not working from his rear and, therefore, is not developing more strength. To begin building strength, start with a regular canter circle to the right. Concentrate on the feel of the cues holding your horse on the right lead and preserve that feeling as you begin the counter-canter. When the canter is established, guide him smoothly off the circle into an open area where you can make a similar circle to the left. Then make a generous turn to the left, holding your left leg firmly against his rib cage to keep him on the right lead. When guiding and balancing your horse in the new direction, lift your right rein, and move it against his neck, keeping his shoulder up and pressing him leftward. Move your left hand out the same distance so the space between your hands stays the same, taking enough feel on both reins to balance the energy you are generating with your leg. As you guide him with your hands, push up and over with your left leg stretching your calf down as far as you can, so it's almost under his rib cage in a position to lift as well as push to get his rear end over. If you don't push enough, he'll probably switch leads instead of staying on the counter-lead. When you've managed to hold the counter-canter at least a quarter of the way around your circle, drop to the trot, then repeat the maneuver, this time to the right on the left lead. Perseverance is key, especially with an older horse. Remember that the wider your turn and the larger your canter circle, the easier it will be for your horse to maintain his right lead. As he develops strength and balance, you can up the degree of difficulty by making your counter-canter circles smaller. In the beginning, some horses have difficulty maintaining their balance and holding a quiet tempo in the counter canter. This imbalance is usually strength related. 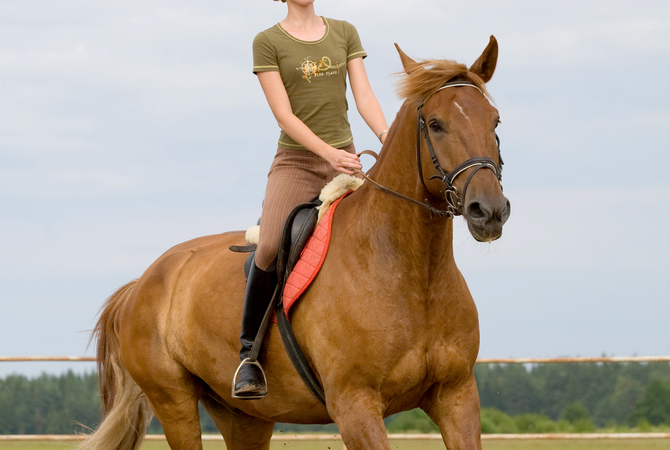 The horse's balance in the canter is delicate and when a rider's weight is added, the untrained horse can maintain a quiet tempo only if he has natural athletic ability or if the rider has the ability to make sure the horse's balance is not compromised because of the rider's lack of skill. A strong, balanced horse carries his weight more on his haunches. Often, the horse's ability to carry more weight on his haunches and not run on his forehand can be developed through better alignment, or straightness, so it is important to concentrate on keeping your horse's neck straight at the base - in front of the shoulders - so the rest of the body will follow. If your horse manages the counter canter in rhythm and balance and remains straight between your legs and hands, you can increase the number of counter canter strides, eventually working your way around the corner. When you and your horse master the mechanics of the counter canter, you can ride circles, serpentines and figures of eight to make the counter canter more interesting for both rider and horse. Many other exercises will also help your horse develop the strength in his hind quarters for a balanced canter and counter canter: Ride up and down hills, jump, engage in small gymnastics, ride over cavalletti and longe your horse.